It is important to understand that phenomenon of pain is a complex medical issue. Diagnostics and treatment of chronic pain syndromes often require a multidisciplinary approach provided by different specialists. Therefore, a diagnostic consultation with physicians working in pain management directions is usually the first step of your treatment. 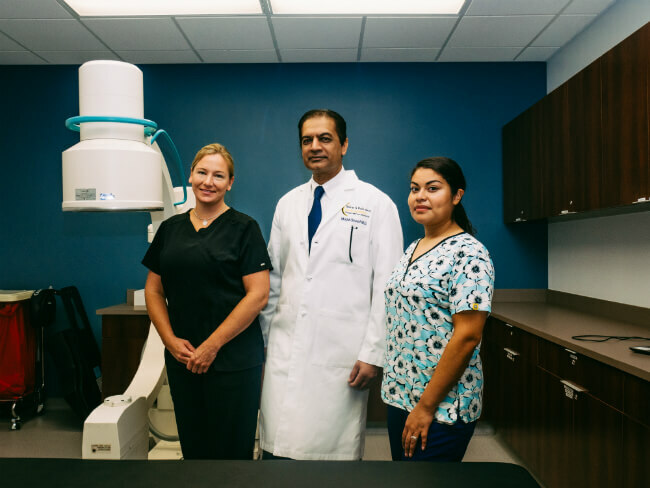 During the diagnostic consultations, pain management specialist will review your medical history, symptoms, medications, x-rays pictures, MRIs and other tests to diagnose the source of your pain. Who is pain management consultants? Pain management consultant is a physician who is specialized in a treatment of acute and chronic pain-related conditions. Pain management consultants provide complete pain care and perform some interventional techniques which are aimed at pain relief. In addition, treatment program involves the multidisciplinary team, utilizing the services of psychologists, physical and occupational therapists. Review of your medical history. The physician will ask you the questions regarding your symptoms and their characteristics, for example when the low back pain or other symptoms occur, how the pain feels, what movements, positions, or treatments make the pain feel better. The physicians will perform a thorough physical exam, such as testing nerve function and muscle strength in certain parts of the leg or arm, testing your reflexes and their characteristics, testing for pain in certain positions, etc. After the physician has some version of pain source, a diagnostic imaging, such as a CT scan or an MRI scan. It may be necessary for confirmation of the suspected cause of pain, as well as for planning the surgical intervention if it is needed.